Natalia, Dipa (2001) Penyesuaian perempuan non-Batak terhadap pasangan hidupnya yang berbudaya Batak. Skripsi thesis, Universitas Tarumanagara. Each person needs to get adjusted with his or her spouse for the sake of marital satisfaction. Self-adjustment is not limited merely between couples but also with the family of the spouse. 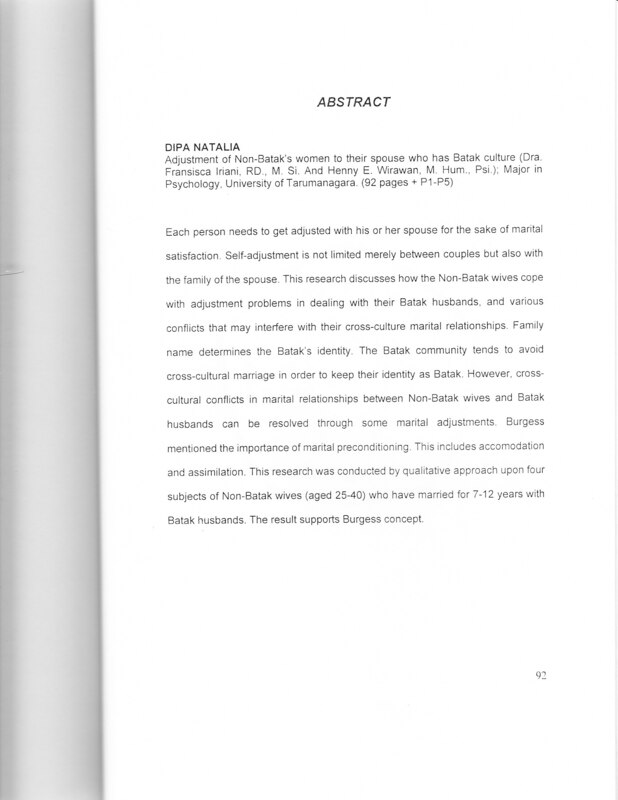 This research discusses how the Non-Batak wives copewith adjustment problems in dealing with their Batak husbands, and various conflicts that may interfere with their cross-culture marital relationships. Family name determines the Batak's identity. The Batak community tends to avoid cross-cultural marriage in order to keep their identity as Batak. However, cross- cultural conflicts in marital relationships between NonBatak wives and Batak husbands can be resolved through some marital adjustments. Burgess mentioned the importance of marital preconditioning. This includes accomodation and assimilation. This research was conducted by qualitative approach upon four subjects of Non-Batak wives (aged 25-40) who have married for 7-12 years with Batak husbands. The result supports Burgess concept.